As a former military wife and mother, I would like to take this opportunity to remind people that there is a war going on, folks. When it “ends” (which it won’t), there will be other wars. Some are more overt than others. The threat of terrorist attack will never again be absent from our daily lives. There is a growing interest in urban gardening in reaction to economic worries. At any rate, without engaging in Y2K-style hysteria, it makes sense to consider reasonable precautions. Some people do this already, for natural disasters – hurricanes, for example, or areas prone to seasonal power outages. Okay, I confess… I am just really cheap and I like grubbing in the dirt. It makes me calm and happy. When we moved to town nearly three years ago, I had a hard time adjusting. I resented having to live here. There is no space or privacy. I had to give up a lot of the things that I enjoyed. I still don’t like living in town, but I love my beautiful house and it’s very convenient. I can live without horses, goats, chickens and other animals, but I miss the dirt the most. I just can’t stand it anymore. Our house has parking lot on two sides, and the other two side yards are very small, close to the road and nearly completely shaded. There are bushy shrubs all around the foundation. And we have rabbits. I have a lovely friend who let me share her garden a couple years ago, but the inconvenience made it impractical. She lives too far away and we only have one car between the three of us here at home. I have a “balcony” over our screen porch that will get more sun, and it would be convenient. The door to the balcony is near the upstairs bathroom door, so I wouldn’t have to lug water up there. I get the heebie jeebies going out there because it doesn’t have railings, though… I could get over that. It doesn’t bother the guys at all. It’s pretty sturdy (the guys go out there) and I think it would be fine for the weight of the plants. The screen porch is on the back of the house, right on the parking lot. It’s the door into the kitchen, and the one we use most often. If I am going to garden, I want to get enough food to make it worthwhile. I want to grow sweet and hot peppers, chard, celery, tomatoes, and lettuce/spinach for salads. I also want to grow herbs – mostly cilantro, and a few others. DH is going to try to grow some pole beans up the side of the shed, but I don’t think that will work. It’s too shady and rabbits live under the shed. So I might grow pole beans on the roof, too. If I can grow them vertically, I would like to do cucumbers (just for salads) and squash (mostly zucchini). 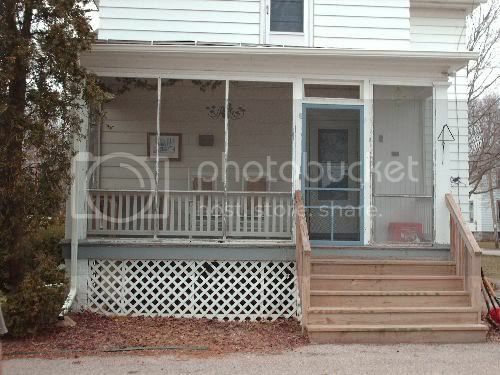 This is the front/side of the house, and you can see the corner of the porch on the right side. 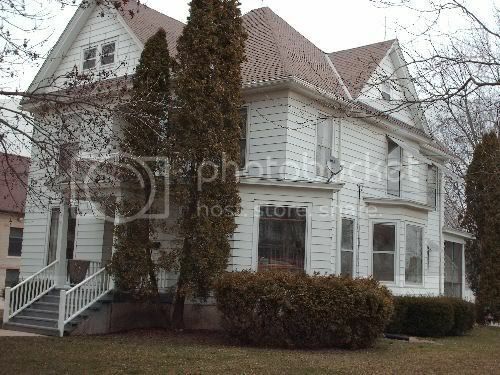 The back of the house faces east, so the second picture is the southwest corner. The front door faces west. This is Wisconsin, so my growing season is limited. I am hoping that Global Warming will work in my favor, but I haven’t seen any evidence of that yet.